Family-friendly festival celebrates the “good” things of Austin with food, fun and fitness activities. 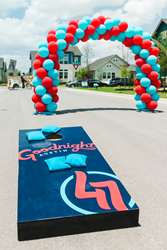 Today, Goodnight Ranch announces the date and details for their 3rd Annual Festival of Good, taking place in the southeast Austin master-planned community on Saturday, May 18th. From 11 a.m. – 3 p.m., the area around Whitter Park (8800 Sikes Way, Austin, TX 78747) will be transformed into a family-friendly block party with local food trucks, activities from local vendors and nonprofits, fun activities for kids and free fitness classes, all overlooking a beautiful pond and natural green space in the Goodnight Ranch neighborhood. This year, the Festival of Good will include more interactive booths and activities such as face painting, kids craft stations, a bounce house, and balloon animals. Thanks to Urbana East at Goodnight, who is revolutionizing apartment living with independent dwellings and private backyards, an adorable red VW van photo booth by The Photo Bus will offer complimentary photos to attendees. Kiddos and fest-goers can also experience an array of exotic animals thanks to Wild Things Zoofari petting zoo, sponsored by Empire Communities, one of the single-family homebuilders building vibrant and distinct one and two-story homes within Goodnight Ranch. Fitness features heavily in this year’s Festival of Good as well. Rogue Running will be on-site sharing complimentary massages and giving away a free pair of sneakers to a lucky winner and, new this year, there will be a range of free 30-minute fitness classes offered on the lawn of Whitter Park. Starting at 11:30 a.m. The Little Yoga House will lead a mommy and me class (open to parents and kids 4+ years old), followed by a 12:30 p.m. MIXXEDFIT exercise class that will get festival goers endorphins pumping. At 1:15 p.m. Maggie Gentry will bring the zen with a 30-minute beginner vinyasa and flow class, and to close out the fitness sessions Camp Gladiator will conduct a 30-minute workout class for fitness fans at 2:00 p.m..
Goodnight Ranch is a mixed-use neighborhood set to transform a former dairy farm in southeast Austin into a vibrant, walkable, tree-lined urban hub. The 700-acre site will be developed over 10 to 15 years and is expected to include up to 3,500 homes; a mixed-use town center; three AISD schools; 226,000 square feet of retail space; more than 120 acres of open space; and landscaped streets designed to integrate a safe network of bike paths, trails and sidewalks. The first phase of the project, the northeast quadrant, is adjacent to Slaughter Lane and includes a mixture of yard homes and condominiums, a community park, and Blazier Elementary School and a future middle school site. For more information, visit http://www.liveatgoodnight.com.